The coastline between Ilfracombe and Combe Martin is backed by lofty cliffs and etched with many sheltered covers and bays. From Ilfracombe, the coastline stretches for over 6 km to Combe Martin, a smaller town in a setting of sea, cliff and valley. There is a striking contrast between the irregularity of rocky shores, sandy stretches and all the intergrading types of shore along this coastline, presenting a rich variety of environments for a varied assembly of flora and fauna. Owing to the large tidal range along the Bristol Channel, the intertidal is often extensive and, because of its northern aspect, only moderately exposed. Different types of shore found along the coastline between Ilfracombe and Combe Martin includes Wild Pear Beach which is predominantly of firm sand with a few fissured reefs. It is moderately exposed and extends for over 150 metres. 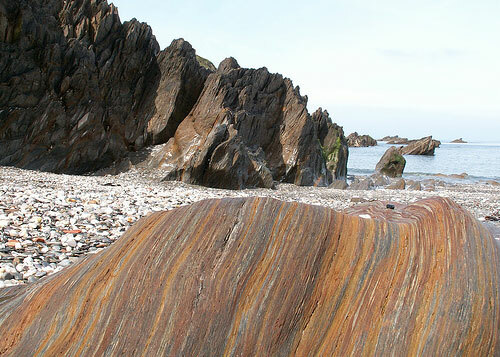 Sandy Bay is a moderately sloping, narrow sandy cove with irregular rock outcrops of Devonian slate and has an intertidal extent of about 250 metres. The shore at the Outfalls, near Ilfracombe, consists of a cobble and sand uppershore with reef ridges extending down the shore towards large mobile boulders on bedrock on the lower shore. Lester Point contrasts sharply with these shores. Here, the steep shore has an intertidal extent of only 5 or 6m and is more exposed to wave action. The steep bedrock is deeply fissured with an extensive covering of the barnacle Chthalamus montagui. The degree of exposure is one of the many factors determining the distribution and occurrence of the varied marine life found in this section of coastline. Both composition and configuration of rock influences populations. The fissures and crevices found between the ridges of weathered shales harbours rich marine populations. The character of the rock surface, the direction and amount of slope is also influential. In areas such as Wild Pear Beach, the force of the waves over long periods has resulted in a gently sloping, relatively flat shore. 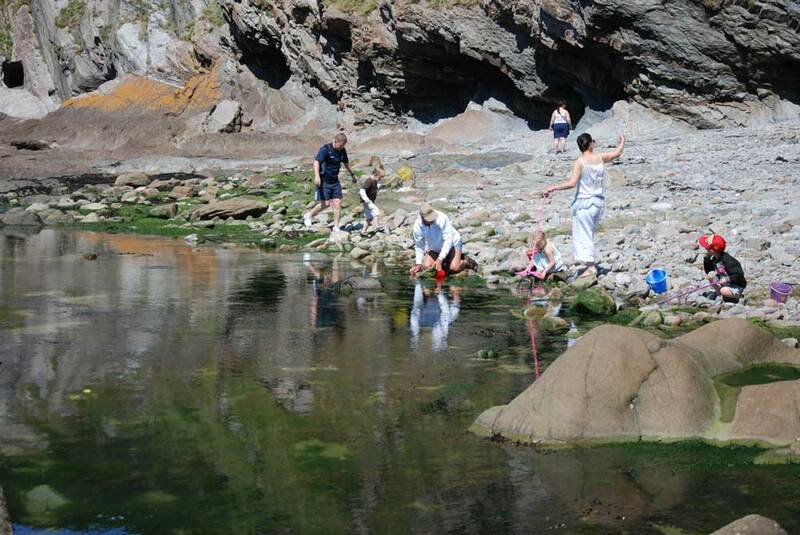 The bedrock is largely broken in other areas, such as Hele Bay, Town Beach at Ilfracombe and The Outfalls, with pinnacles and gullies, overhangs and rockpools. There are a number of reefs along this coastline towards low water lying adjacent to sand which are largely sand scoured. Localised shelter gained from rockpools, crevices, gullies and overhangs increase the diversity of marine life on the shore. Rockpools are richly decorated with plants and animals. In fairly exposed pools such as can be found on Wild Pear Beach, the walls are typically encrusted with pink Lithophyllum with little forests of the coralline alga Corallina officinalis and the dark green alga Cladophora sp. With them are often many grazing snails such as limpets, top shells and periwinkles. 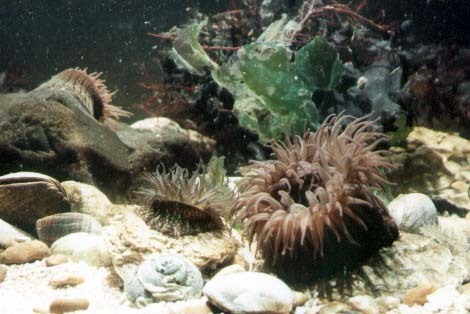 Rockpools are the best place in which to view anemones as they are more likely to be expanded. The commonest is the Beadlet Anemone, Actinia equina. The colour is very variable, some being brilliant red, others various shades of brown, green and orange. The green colour form is particularly common on the north Devon coast. The Strawberry Anemone Actinia fragacea is also a common sight along the north Devon coast. The tube-dwelling worm Bispira volutacornis, which is the largest fanworm of its kind in our waters has a magnificent spirally wound crown of tentacles and is found in rockpools at Lester Point amongst the crustose coralline alga Mesophyllum lichenoides. 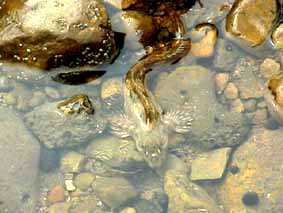 The Leopard-spotted Goby, Thorogobius ephippiatus, is a quite retiring fish living in crevices in vertical and steep rock faces below extreme low water. However, individuals are occasionally found in rockpools here sitting out the low water along with the varying coloured Shanny (=Blenny), Lipophrys pholis, often an olive or darker green blotched with black. The delicate, funnel-shaped green alga Monostroma grevellii is to be found in rockpools in Sandy bay attached to other algae and mollusc shells. Other algae found in rock pools here include Carageenan Moss Chondrus crispus, Mastocarpus stellatus, Ceramium sp., Laurencia pinnatifida, Gelidium pusillum, Dumontia incrassata and Cystoclonium purpureum to name but a few. Vertical and overhanging rock surfaces on the lower shores, as at Smallmouth Bay and Tunnels beach, support interesting and diverse faunal communities. Encrusting sponges Hymeniacidon perleve and Dysidea fragile and the erect bryozoans Scrupocellaria sp., Schizomavella linearis, Crisiidae sp., and Bugula plumosa are especially conspicuous. 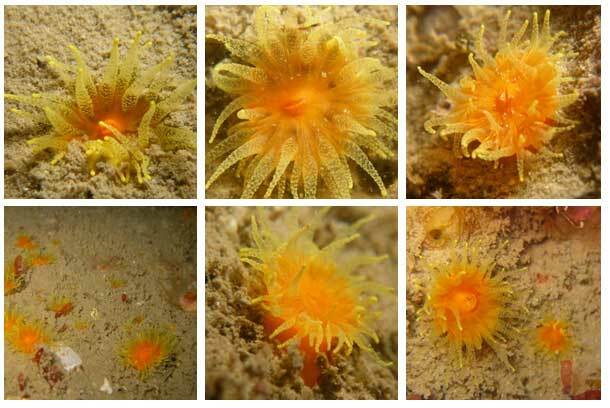 This site supports the rare Scarlet-and-gold-star Coral Balanophyllia regia and Isozonthus sulcatus. In addition, the Devonshire Cup Coral Caryophyllia smithii, the globular sponge Tethya auriantium and Polymastia mammilaris are present. These are species not commonly found in the intertidal, preferring shallow waters. At Hele Bay, good crevice communities are to be found in the fissures and crevices in the extensive bedrock on the shore. The green algae Chaetomorpha sp., Cladophora sp., and feather-like Bryopsis sp., are to be found in crevices at this site along with the red algae Lomentaria articulata, Catenella caespitosa and Plumaria elegans. Sponges are represented here by the encrusting form Hymeniacidon perleve and the bread-crumb spone Halichondria panicea. Anemones include the Beadlet Anemone Actinia equina, the Snakelocks Anemone Anemonia viridis and the Daisy Anemone Cereus pedunculatus. At the Town Beach, Ilfracombe, the crevices and fissures are dominated by the Mussel Mytilus edulis. The red algae Alnfeltia plicata, Gelidium latifolium, Polysiphonia sp. and Catenella caespitosa are also represented. Sandy shores provide startling contrast to exposed rocky shores. Although they appear barren and without a trace of life, after they have been uncovered by the tide for a while, broken surfaces and worm casts indicate the presence of life below the surface. As a habitat, sandy shores differ greatly from rocky shores. As there are no surfaces for attachment or sheltering rocks, protection is gained by a capacity to burrow. The species found in sandy pockets reflect this. In Sandy Bay, two worms commonly found on the lower shore are the Sand Mason Lanice conchilega and the Lugworm Arenicola marina. When the tide is out, the tubes of sand grains fringed with branching threads can be seen projecting about 3 cm from the surface of the sand. The lug worm Arenicola marina is responsible for the conspicuous shallow depressions and worm casts on the lower shore. Also found at Sandy Bay is Tellina tenuis. The bivalve can be recognised by its delicate, translucent oval shell, which is often tinted with pink, yellow or orange. A ramble along this coastline will be rewarded with stunning scenery, and if time is taken to pause, the beautiful colours and textures of the red, green and brown seaweeds will be revealed along with the often inconspicuous, but undeniably present, animal-life lurking in crevices, overhangs and rockpools. MARINE WILDLIFE OF ATLANTIC EUROPE by DR. AMANDA YOUNG. Readers of 'Glaucus' will be already be familiar with Amanda's beautifully concise and authoritative style of writing. Combine this with some superb colour photography by Paul Kay and the result is an absolute gem of a reference book on marine life. Although not covering all species many of the most well known animals are described in detail thus complementing other more general marine life reference works. For the marine enthusiast this book is an essential purchase and it should be on the shelves of every reference library in the country. "I had been spending a summer at Ilfracombe ............. It was a spring-tide in September, and the water had receded lower than I had seen it since I had been at the place. I was searching among the extremely rugged rocks that run out from the Tunnels, forming walls and pinnacles of dangerous abruptness, with deep, almost inaccessible cavities between. Into one of these, at the very verge of the water, I managed to scramble down; and found round a corner a sort of oblong basin, about ten feel long, in which the water remained, a tide-pool of three feet deep in the middle .......... I had examined a good many things, of which the only novelty was the pretty narrow fronds of Flustra chartacea in some abundance, and was just about to come out, when by eye rested on what I at once saw to be a Madrepore, but of an unusual colour, a most refulgent orange .."
Balanophyllia regia was discovered by P H Gosse in 1852. The above extract, from Gosse's Actinologia britannica gives a graphic account of the event. The names Madrepore and Madreporaria were formerly applied universally to any stony coral of the family Scleractinia. The corallum has the from of a tree trunk with the base being much broader than the column. The whole tending to look rather porous. The plates are well developed and form a six-rayed star. Generally the form can be described as rather curious. Unlike its near relative Caryophyllia smithi, this species cannot completely withdraw into its 'cup' and the vivid orange coloration is permanently on display. It can, however, withdraw its tentacles and readily does so if left in a still pool at low tide. Only at full expansion can the exquisite beauty of this creature be fully appreciated. When the yellow flecked tentacles surround the rich orange/scarlet disk, the sight of even a small group of individuals is quite breathtaking. Never more than about l cm in height, with a 1.5 tentacle span. Tentacles number about fifty, are long, and do not possess terminal knobs. This appears to be little documented other than a record in the Plymouth Marine Fauna (1957) handbook. (MBA UK) of extrusion of planulae in late spring. There is also a reference in Gosse to "clusters of ova" discharged in September. 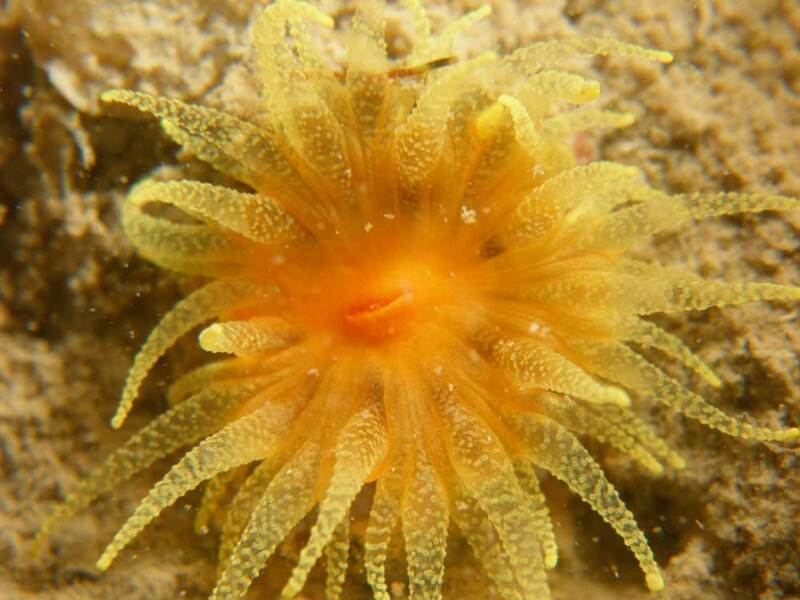 I have encountered this fascinating coral on five separate occasions, all of them on the stretch of coast between Combe Martin and Ilfracombe in North Devon. To say that the animal is difficult to find would be an understatement. Despite the brilliant coloration, its small size and the habit of living either near to or amongst sponges of the same orange hue, gives it the perfect camouflage. I eventually found my first specimens by touch! One specimen I found was actually lying at the bottom of a small pool in Ilfracombe harbour, completely unattached to anything. I concluded that perhaps this coral's cup is rather brittle and cannot withstand strong water currents. This particular specimen spent nine months in my aquarium, where it thrived on a diet of plankton and fragments of boiled mussel. Sadly, it was eventually devoured by a Painted Topshell, Calliostoma ziziphinum, not the first time I have noted this particular gastropods' interest in both hard and soft coral tissue. © 1997 Some images were added in 2012.